In my last post, I described what I know about events and event planning. With our annual internal corporate team event coming up ("Knowledge Days"), I'm tasked with helping devise knowledge sharing games or ice breakers. A past event included a great "who did it" game devised by +Elena Serghie (check out her blog, In Time for some some great SDL Tridion guides especially her first post, which is likely one of the most cited resources in the community). If I recall correctly, teams competed to figure out who did what in Tridion and where. I'm now creating some ice breaker games featuring the biggest thing for the group since, well since it was just the one (Tridion) group. Based on a theme of "Connected," with a focus on team building across a mix of roles (not all technical), I've come up with three team-based games involving product knowledge, chance, risk, and Customer Experience Management. Feel free to try something similar at your next event and let me know how it goes in a comment. If you're familiar with Information Systems, you might recognize these as input, processing, and output but the focus is on the customer as well as the challenges with making "contextual experience" work across this empowered customer's pre-purchase, purchase, and post-purchase stages. To play pillars and journeys randomly create small 3-5 player teams to work together. Play goes from one team to the other, starting by rolling a die or pair of dice. Choose Pillar and Journey Step: role dice (see above) or otherwise get a random selection of a pillar (insight, orchestration, or contextual experience) and journey step (pre-purchase, purchase, or post-purchase). Skip any repeated combinations. Time. Start a 60-second timer. Type of software. At least one type of solution that fits the combination, this could be something as simple as "a website" or "CMS." The Winner is chosen based on points after every time has had a chance to go. Vary speed and depth of the answer as needed. A single round for five teams can take a half hour. Record and aggregate these into a matrix to remember the fun, confusion, and any learning that happens to take place. The solutions and products can include suites, packages, modules, add-ons, or even community contributions. The main point is to help translate these concepts into practical and familiar solutions as well as help teams know how the pieces fit together. Update (2014-06-02): having run the game, we found that each subsequent team would build on each answer making for a rather unfair game by the end. I would recommend modifying the game in terms of timing and scoring. One minute seemed to work, this could be extended to maybe 1 min 30 seconds, but too long will take away from the urgency. Optionally limit time for both the huddle and answer (to avoid teams from adding "one more thing") or rely on a written response instead. Allow teams to add answers to other answers for extra points. Choose a starting team (or individual) randomly (or use existing teams). Choose two pillars (or products) by rolling dice or with a random number generator (IDE of your choice or online). Each team comes huddles for 30 seconds and writes down the answer to the correct integration(s) along with their team number. Each team with the right answer gets 5 points (or double what they've put down). Continue until time is up. Each team plays each round. The round ends if there are no challenges. The other teams can choose to challenge by suggesting the right answer. If correct, the challenger wins 5 points and the incorrect team loses 2 points. Play proceeds from team-to-team by number or simply "clockwise." Update: to be fair after Pillars and Journeys, we'll run challenges all at once, only accept written answers, and perhaps even up the amounts to allow "betting." The judge can award arbitrary bonus points for creativity or distinguishing between, or otherwise identifying versions. Official answers should come from the documentation or if not available, by team consensus and possibly yelling. For example, if given SDL Tridion and Microsoft SharePoint, you might come up with "SharePoint Connector" for 5 points but the judge might give you more points if you suggest the CMIS Connector. If using pillars, the combination might be "Orchestration" with "Insights" and you could answer SDL Tridion with CMA using Target Groups. This can be run as a think-on-your-feet type game or an exercise that ends at a major break or end of a given day. The host solicits company names and industries to be submitted before the event, on pieces of paper (or cards) at the event, or simply written on a white board or screen. A company or industry is chose by the host or judge, possibly randomly. The Journey Chooser then creates a multi-step journey. For example pre-purchase, purchase, and post purchase for a "customer journey." In my last post I described pre-event, at-the-event, and post-event. Think about the real customers of your customer as well as subtle journeys. For example in B2B, the purchaser's journey differs from the "2B's" actual customers. Each journey may differ. 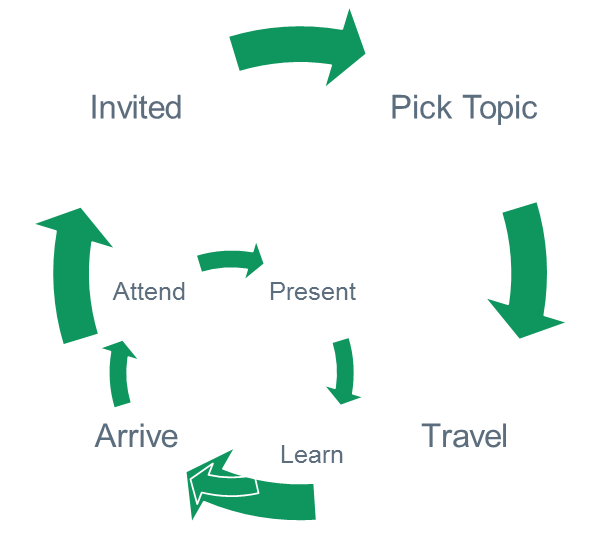 Here's an example for an "Event" journey. The judge then awards points based on the preferred criteria for this session. Quantity: how many personas can you make? Impression: how "real" do the personas seem? I've tried role play in training with mixed success before; we'll see how these work out. I think Pillars and Journeys might evoke chaos as we debate product roles and possibilities. Name the Connection might be popular among the know-it-alls. And if we have time for Choose Your own Journey and personas, we'll find that identifying true customers is likely as hard as working through, and challenging, assumptions about representative personas. So, think games, questions, and points can help people engage, learn, and answer? It seems to work on Tridion Stack Exchange. So maybe I shouldn't mention anything about cash prizes.